Body Shop is one of a handful of skincare brands that I've come to love again over the past year. Dry skin has been my major problem this winter as I've said before, so I bought the Vitamin E Cream Cleanser and Vitamin E Toner. I've replaced these with my usuals, and I'm absolutely loving them. For starters, I love the soft scents. Does anyone else find the scents remind you of baby shampoo? I love it! They're both very light on the skin but work really well in rehydrating. I've found they work really well in prepping, cleaning and moisturising my skin and are a great pair to use before Decleor's Nerolli Essential Night Balm as part of my night-time skincare routine. I also bought their BB colour-adapting cream for the weekdays. During the week, I wake up early (early for me) for work and I'm just not a morning person; I'm very grumpy and usually on slow-mode until 10. This usually means putting on make-up feels like it takes forever, so quick make-up tools are my favourite things. I have mixed feelings about the BB cream. I've been using it the past month. It comes out greyish white from the tube but magically blends into your skin as you apply it. What I do like about it is that it gives my skin a really nice glow and feels light on the skin -I hate heavy-feeling BB and CC creams or foundations. It matches my skin quite well too (I use number 03) and creates a really nice glowy look with Mac's Mineralise Skin Finish Natural (I use medium dark). But, the coverage is minimal, meaning you have to apply concealer on top to disguise dark circles and it doesn't last all day. Another point is that it doesn't include sunscreen. That doesn't bother me as I have to apply a sunscreen of factor 50 anyway (advised by my laser technician). The Vitamin E cleanser and toner work really well in removing the BB cream too (or what remains of it). So now, I'm in the market for another BB or CC cream that I can use for my work make-up. Let me know what your favourites are. 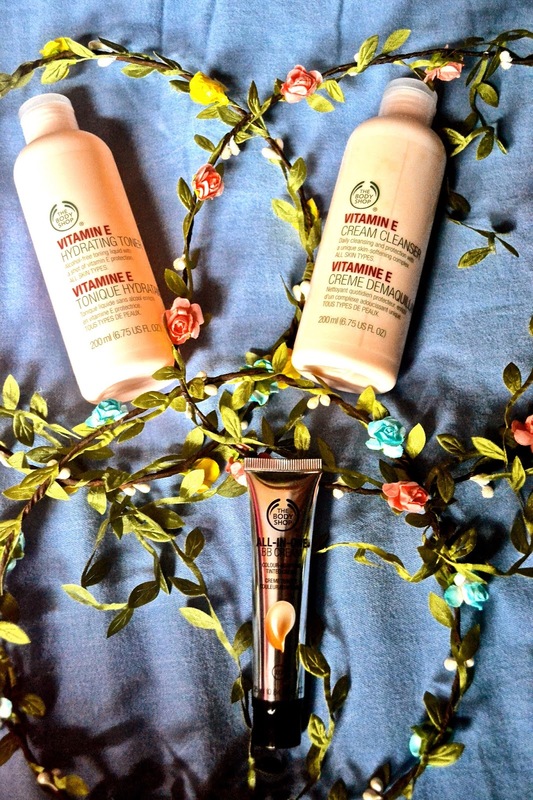 Are you loving the Body Shop's Vitamin E range as much as I am? Tweet me your thoughts or drop a comment below.